Република Србија; на латиници: Republika Srbija) је континентална држава која се налази у југоисточној Европи (на Балканском полуострву) и у средњој Европи (Панонској низији). У саставу Републике Србије су и две аутономне покрајине Војводина и Косово и Метохија. Република Србија је демократска држава свих грађана који живе на њеној територији, заснована на владавини права. Србија се на северу граничи са Мађарском, на истоку са Румунијом и Бугарском, на југу са Републиком Македонијом и Албанијом, а на западу са Црном Гором, Хрватском и Босном и Херцеговином (Републиком Српском). Republika Srbija je država locirana u jugoistočnoj Europi (na Balkanskom poluostrvu/poluotoku) i u srednjoj Europi (Panonskoj niziji). U sastavu Republike Srbije se nalaze i dve autonomne pokrajine Vojvodina i Kosovo i Metohija. Srbija se na severu graniči s Mađarskom, na istoku s Rumunijom i Bugarskom, na jugu s Makedonijom i Albanijom, a na zapadu s Crnom Gorom, Bosnom i Hercegovinom i Hrvatskom. The Republic of Serbia is a landlocked country in Central and Southeastern Europe, covering the central part of the Balkan Peninsula and the southern part of the Pannonian Plain. It is bordered by ► Hungary to the north; ► Romania and ► Bulgaria to the east; ► Albania and the ► Republic of Macedonia to the south; and ► Montenegro, ► Croatia and ► Bosnia and Herzegovina with the ► Republika Srpska to the west. 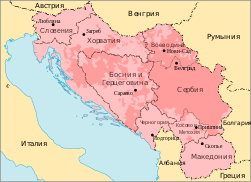 According to Serbian constitution, Serbia has two autonomous provinces: ► Vojvodina, in the north (which has 7 districts, 46 municipalities), and ► Kosovo (in the south), which declared independence from Serbia in 2008. More images Serbia - Serbia (Category). 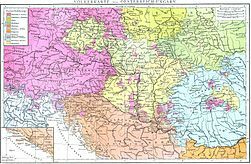 This section holds a short summary of the history of the area of present-day Serbia, illustrated with maps, including historical maps of former countries and empires that included present-day Serbia. 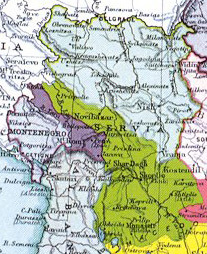 Empire of the Romans (Greeks) and Serbs and whole Albania (Empire of Simeon Uroš - Siniša), 14th century. Vlachs in Central Serbia (2002 census). Note: There are conflicting views about the issue whether Vlachs are separate ethnicity or part of Romanian ethnicity. Vlachs in Central Serbia (estimations by Viorel Dolha). Note 1: Data presented in this map does not correspond with official data from 2002 census in Serbia, which show Vlach majority in smaller number of settlements. Note 2: There are conflicting views about the issue whether Vlachs are separate ethnicity or part of Romanian ethnicity. Romanian and Vlach language in Serbia (census 2002). Note: There are conflicting views about the issue whether Vlach is separate language or part of Romanian language.